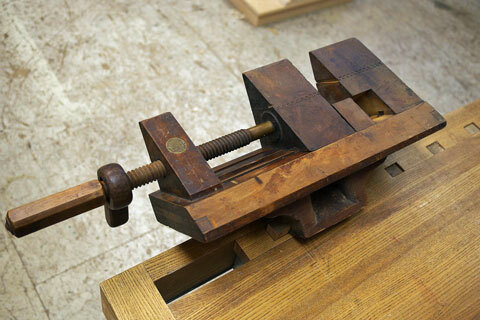 What happens when you sync up a Plate 11 Workbench Kit with a Lake Erie Toolworks wooden vise kit? 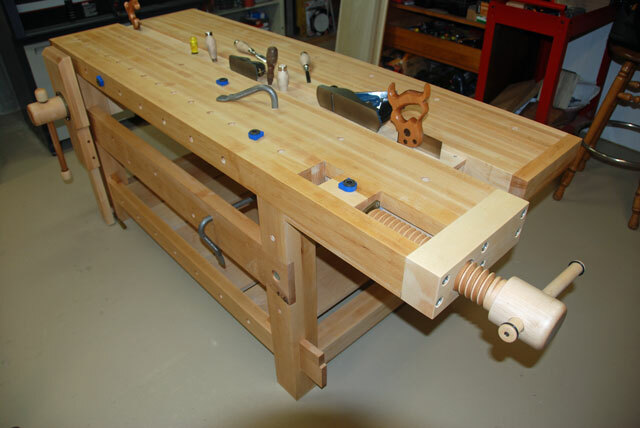 You end up with one amazing Roubo Workbench that will help you build some tremendous things in your home workshop. 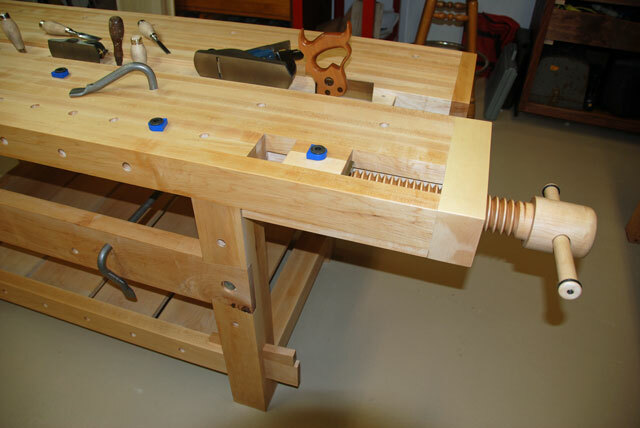 This said, if you happen to be attending the upcoming Lie-Nielsen Hand Tool Event in Round Rock (Austin), Texas coming up on November 21-22, 2014, you will get to see and ‘kick the tires” on this great Roubo for yourself. Our good friend Mark Hicks from Plate 11 Bench Company will be attending this event held at Techshop to demonstrate the great features of his workbench kits, but he will also be offering a special price on a fully built and ready to go Roubo Workbench that comes equipped with a wooden leg vise from Lake Erie, a Criss-Cross from Benchcrafted and an iron planing stop from Peter Ross all for just $3200. Simply too good to pass up. 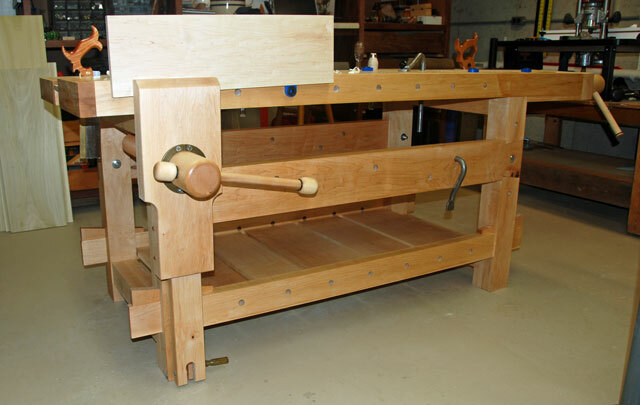 For some additional background on Mark Hicks and the Plate 11 Workbench Company, here’s a link to a Highland Woodworking Video Blog post from the recent Woodworking in America 2014 event held in North Carolina. We hope you enjoy this. 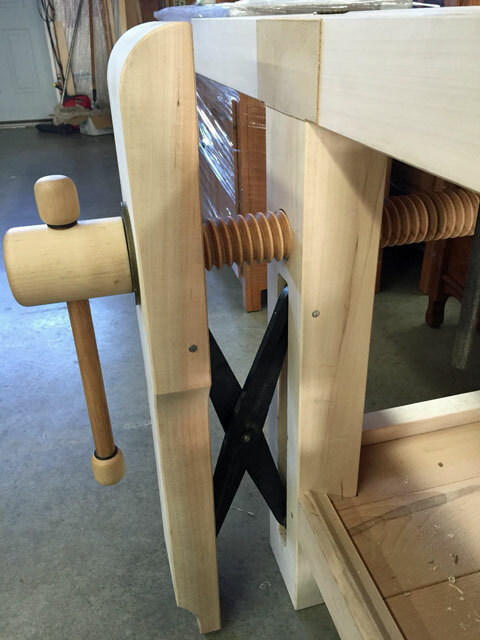 Heads up that we’ve been working with Jameel Abraham to construct and provide the wooden vise screw and nut components for the La Forge Royale Miter Jack kit that Benchcrafted is putting together. For additional details on this limited run vise, select the link below – but act quickly as they are sure to go fast. 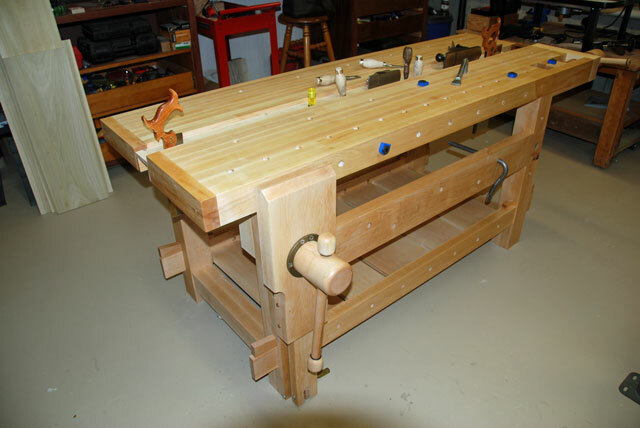 Our November 2014 Workbench of the Month comes to us from Ron from Sugar Grove, Illinois. 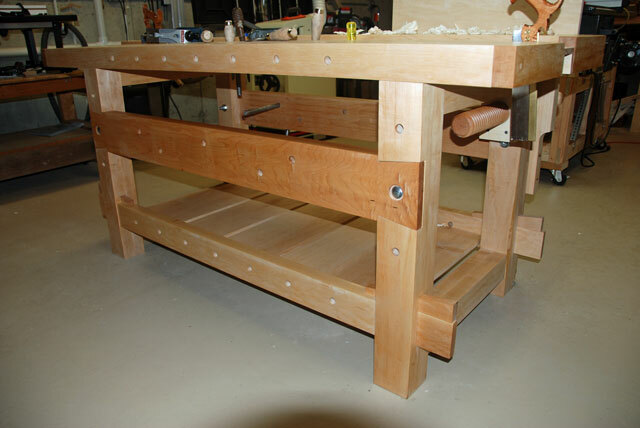 Ron has constructed an amazing hard maple modern split top bench that has both a leg and wagon vise. This is sure to provide him with countless years of use and enjoyment. We know you are all going to appreciate the true craftsmanship demonstrated in this fine workbench. Tremendous job Ron. 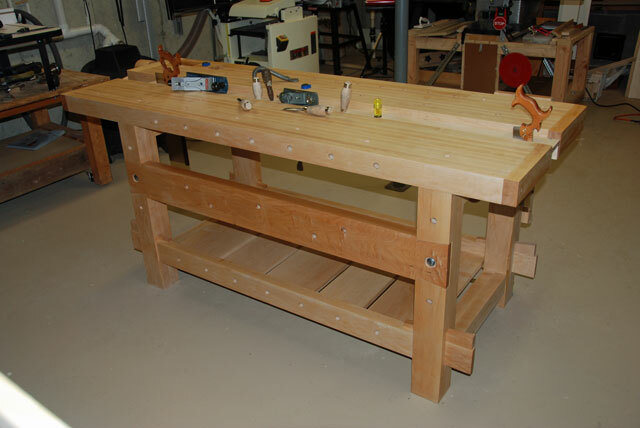 I am sending you some photos of the workbench I recently finished. 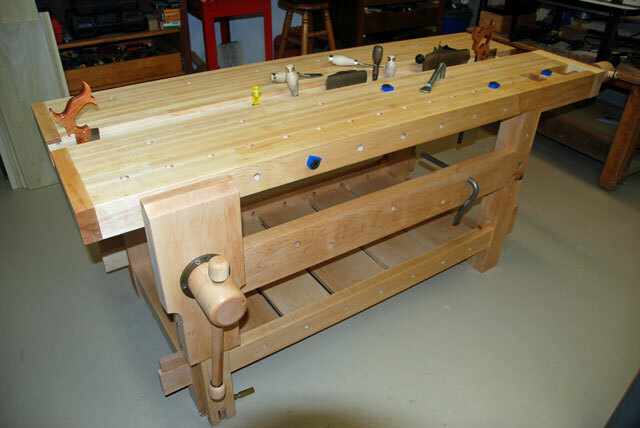 I purchased the Wagon vise kit and a basic vise screw and nut from you last fall and have incorporated them building this bench. The bench is a Robert Lang bench design published in the October 2008 Popular Woodworking Magazine. The unique construction features of this bench made it an attractive alternative for my shop should I relocate my shop in the future. 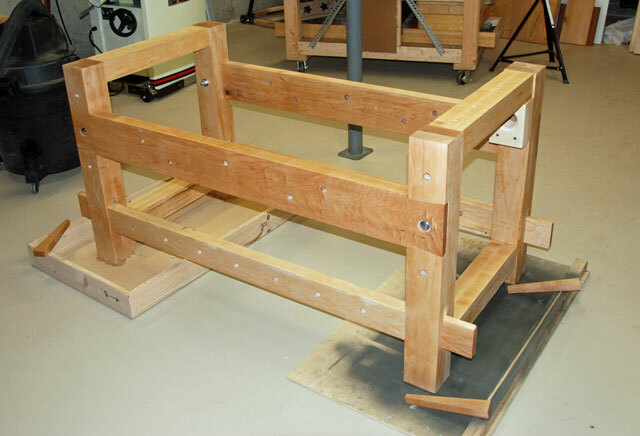 Although it is a heavy bench weighing close to 400 pounds, it can be completely disassembled and ready to move in about 30 minutes. A number of “old world” design features make this bench a lot of fun to build without being too complicated for a novice builder. Though expensive, I used hard maple. It was readily available in a good variety of rough sizes. Hard maple is great to work with and is easy to cut if you have sharp blades. And, it helps to have a good 12-inch jointer and planer to handle the big pieces. This design requires quite a bit of hand cutting, the tendons, dovetails, and ends. I really like my big, sharp tendon saw from Bad Axe Saws. Numbering or coding of each piece is mandatory as many of the pieces look alike but only fit one place. Another good feature of the bench design was the ability to easily modify the dimensions. 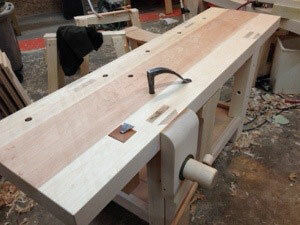 My workshop would not support as long of a bench as Lang’s creation. 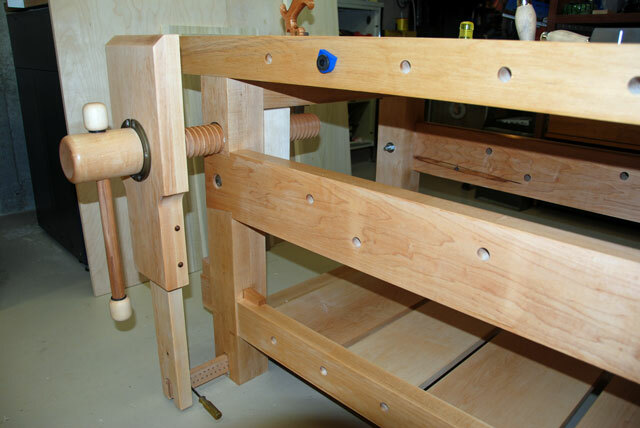 So I shortened my bench a bit and, of course, installed the Lake Erie traditional wood screw wagon vice and a Roubo style leg vise. Although quite a bit of work to install, the vises not only look nice but also are operationally smooth and solid. 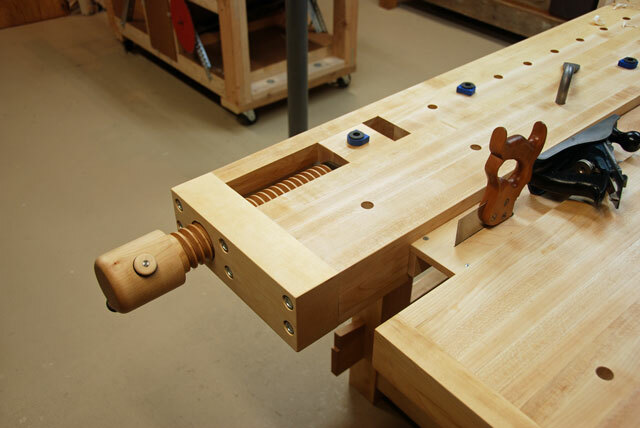 Lang’s design also incorporated some tool and bench trays between the two workbench tops. 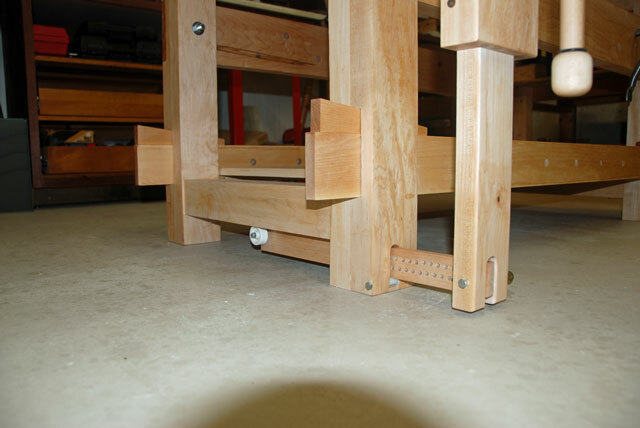 Having changed dimensions, I simply made a long tool holder that can be removed for center table clamping or layout. As a last step, I simply coated it with Danish Oil and began using it immediately. Thank you for your assistance in ordering the parts I needed, and, for the precision of your product. The quality is outstanding.